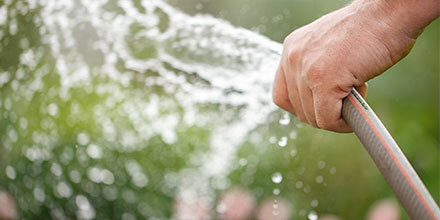 Keeping It Healthy: Watering - How to best support your grass and turf to keep it healthy. You should water heavily and infrequently. The aim is to develop a good root system. The grass roots will search for water by pushing down so it’s OK to let grass get a little thirsty. Light and regular watering means shallow roots which in times of drought means more stress in the summer. It also encourages weed growth and greater chance of disease. This depends on your location, your soil, how sunny your garden is and other things growing like tree roots. Generally the best time to water is when the grass starts to dry out and grass starts to yellow. If you leave it till the ground is hard and dry and the grass is going brown, it will not take up water well. Better to let nature take its course and bring your lawn back naturally. A good soak every 10 days should be fine. You should see minor puddles on the surface. Late evening or night time when the sun has gone down and it is cooler. Or first thing in the morning when the grass may be naturally wet with dew. NOT IN THE MIDDLE OF THE DAY – it’s a waste of water as most will evaporate.